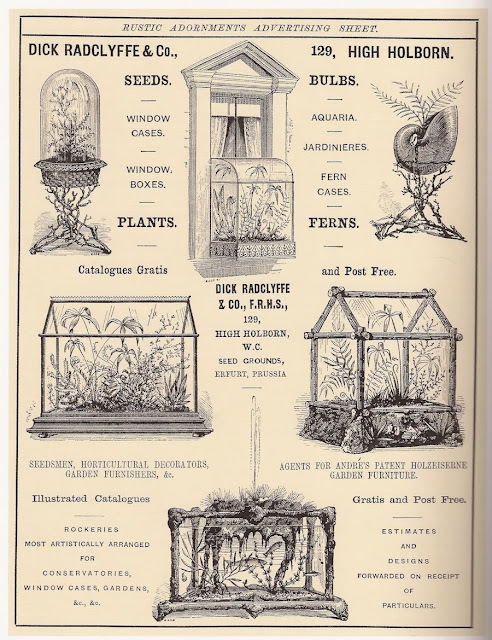 Collecting ferns and moss was quite the fashion for the Victorians, so much so that one might have called it an obsession. Fern enthusiasts traded and promenaded their fantastical ferns, going as far as making treks out to the wild to collect rare specimens. An over-enthusiastic, fern-seeker even tumbled to her death while reaching for an elusive cliff-dwelling specimen. Sarah Whittingham traces this phenomenon in her glossy book "Fern Fever: The Story of Pteridomania." 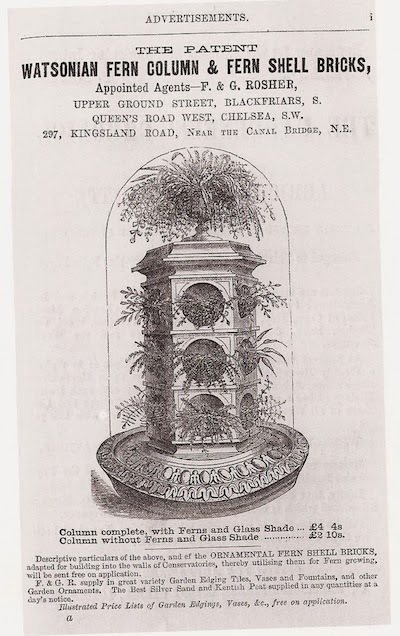 Jam packed with lush photos of ferneries, fern grotto gardens, and decorative arts graced with fern fronds, she forms an overwhelming set of evidence for the Victorian fern fever, or pteridomania. Interestingly enough, young women embraced fern fever the most avidly of all Victorians. 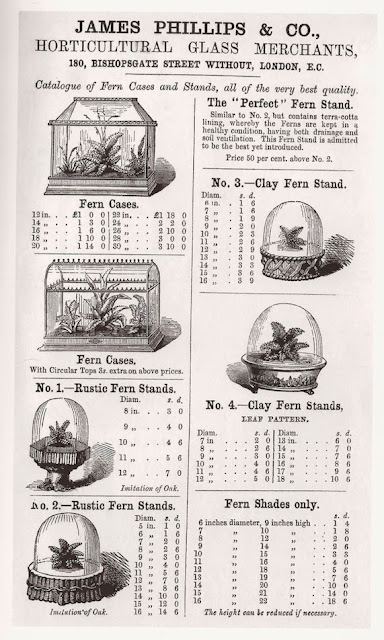 Much like the pop star-crazed tweens of today, Victorian teens were engrossed in trading fern specimen collector cards and begging their parents to install fern grottoes in their basements. Even the daughter of novelist Charles Dickens developed mild pteriodomania. "After careful cross examining my daughter . . . I do NOT believe her to be worthy of the fernery . . . When I ask her where she would have the fernery and what she would do with it, the witness falters, turns pale, becomes confused, and says: 'Perhaps it would be better not to have it at all." 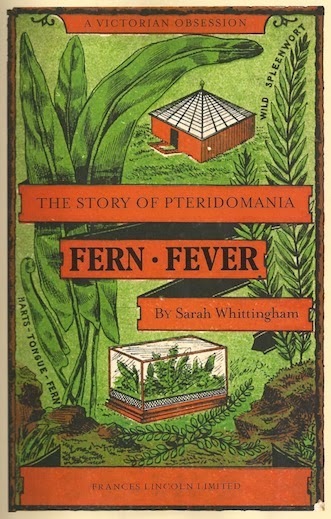 "Fern Fever: The Story of Pteridomania"
Gosh, Dickens. Maybe if you hadn't bullied your daughter over it you could have both enjoyed an entrancing fern grotto. 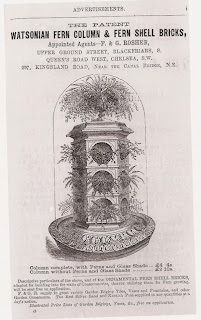 Of course the ferns did hold a sort of "fantastical" fascination for many Victorians. Some enthusiasts connected ferns with faeries and fantasy, while others touted it as a healthy study of natural science and a great family activity to fern hunt in the countryside on a weekend. Clever folks published lucrative fern field guides; stuffy folk formed formal fern societies and journals. Incidentally, all these ferns necessitated all sorts of fern cases, aquariums, terrariums and other methods of constructing suitable environments for the precious and often costly fern specimens. I share a few copies of the advertisements for Victorian fern cases from the book.